She was. And she was only seventeen years old, a recent high-school graduate. The year was 1963. “Your father can never know.” And with those words, began Mom’s journey to Vancouver Island where she worked first as a housekeeper, and later as a Mother’s Helper to a naval officer’s wife overwhelmed with raising three children alone while her husband was at sea. Mom’s dad and her five siblings were told she had a new job. No one else in the family knew she was pregnant. 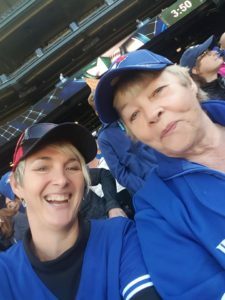 When her pregnancy advanced to the point she could no longer safely do her job, she was transferred back to mainland BC to the Maywood Home for Unwed Mothers in Vancouver. Mom doesn’t remember exactly how long she stayed in the Home, a month or so, before her labor started. A nun escorted her to Vancouver’s Grace Hospital, where after laboring alone for hours in April of 1964, she eventually birthed a girl, and named her for her youngest sister and her mother. Five days later, her mother collected her from the hospital. They paused at the Nursery window, and both left crying. Mom cried for weeks, but privately. Her mother made it very plain she was to tell no one about the baby. For almost two decades, Mom kept the secret bottled inside her. And it nearly broke her. I was fifteen when she finally told me about my older sister, the circumstances around her birth. We both sobbed. And sobbed. Mom’s pain and shame was a raw then, as it was in 1998 when she finally met her eldest child. I’d like to say the reunion resulted in a lifelong loving relationship. It didn’t. Not all adoption reunions get a HEA. And that is in part what inspired My Dear One; to give my heroine, Dianna, the happy ending my mother could only wish for. Mom and me at a Blue Jays game. She’s a Blue Jays fanatic! Mom eventually sought counselling and received the guidance and support she needed to begin healing, some thirty-four years after leaving her daughter in a hospital bassinet for others to raise. There is no way to know if that was the best decision, or if my mom could have provided a good life for my half-sister had she the resources and support to keep her, because keeping her simply wasn’t a viable option. Mom is only one of millions of young women, throughout history, coerced by family or circumstances into relinquishing a child in belief it was better for both baby, and the birth mother. Time, knowledge, and education and awareness of the psychological harm forced and secret adoptions inflict on not only the mothers, but later on, adoptees desperate to discover their origins, has resulted in positive change. People facing unexpected pregnancies today have options, resources, and assistance, to help them make informed decisions. The Internet provides them and others access to a massive online network of support groups for birthmothers and fathers, adoptees, and adoptive families. My mom found her greatest salvation in an online group of women, who like her, grieved the loss of their secret babies. They’ve since become good friends, and frequently get together to visit, to laugh and scold, encourage and challenge each other. With their help, Mom’s come to terms with her birth daughter’s decision to not maintain contact, though Mom has left the door open should C change her mind. If you’re a birth mother or father, or adoptee, with unresolved pain regarding the loss of your birth child, or parents, please reach out. Help is there. You don’t have to suffer alone, or in silence, any more. Mom wasn’t my only inspiration. Read about the other woman whose real-life journey was the impetus for my choice of transport for the heroine in my first novel.